Here's a superb new online slot game from Eyecon. Back by popular demand, this is a remake of the hugely successful Sugar Train slot by Eyecon. This Christmas themed version tastes just as sweet as the fantastic original. Players can look forward to lots of free games and bonuses on SlotsBaby! Get yourself into the festive spirit with symbols such as presents, candy canes, and cute gummy bears in Santa hats! Be warned, the mouth-watering doughnuts and Christmas tree cupcakes are going to set your stomach rumbling! This slots casino game may be Xmas themed but its great fun to play all year round and is particularly good fun for new players as it is very easy to pick up! Eyecon Pty Ltd is an Australian based company producing popular slots. They have over one hundred slots in their portfolio, typically characterised by great 3D graphics which make for an immersive experience. They have been producing high quality games since 1997, so you are in good hands. However their expertise and focus is in land-based gaming rather than online casinos, you won’t find cutting edge technologies in their slots. If you’re happy with games that are slightly more traditional and slightly less complex, you’ll enjoy their portfolio. I really love the cheerful cartoon-like graphics of this game. Brightly coloured candy canes and other sweet treats scroll across a backdrop of snowy hills festooned with lollipop trees, exuding festive cheer! This is a twenty five payline game set up with five reels and three rows. Maximum bet across the lines ranged from 1 to 50 coins, meaning you can play as safe or as boldly as you like! Players can also choose the number of lines they want to play with, from 1 up to 25 – choose wisely! There is also an autoplay feature, which players can activate to get the computer to take 10, 20, 50, or 100 spins for them. You can stop autoplay at any time. An exciting element is added by the ‘Gamble’ feature. If you win, you can take a gamble and guess the suit of a playing card. If you get the suit right, your winnings are quadrupled; if you get the colour right, your winnings are doubled; but if you get it wrong, you lose everything! Wilds – gummy bears are your tasty wilds. Free games will be activated if you have three or more gummy bears on screen at a time. Scatters – the rainbow item is your scatter. Having more than three rainbows on screen multiplies your winnings! 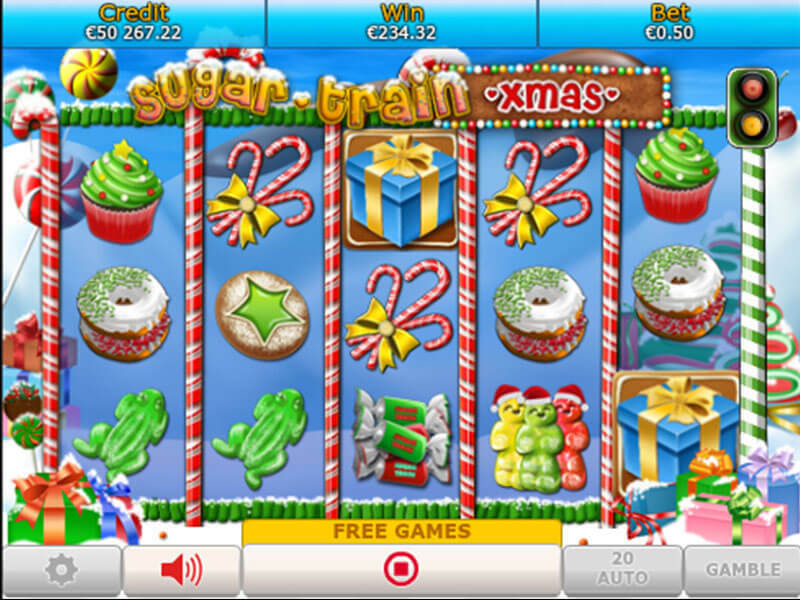 If you were a fan of the original Sugar Train game, you should definitely try this festive version! It is a great easy-access game for newbies, but even more experienced players will enjoy the sweet sensations offered by this slot! The gamble feature adds to the excitement of this game, making it far more than just a bit of light-hearted fun! Make sure you have some snacks in the cupboards though because playing this game will make you crave something sweet! If you enjoyed then you might also like Shamans Dream.